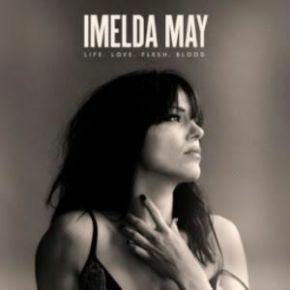 Irish superstar singer and songwriter Imelda May today topped the UK Americana chart with her highly praised new album - ‘Life. Love. Flesh. Blood’ and landed No.5 in the official UK album chart (her second UK top 5), ahead of artists including Texas and Drake with her strongest first sales week ever in the UK, and the album has debuted at No.2 in her native Ireland. Imelda has had a jam-packed week of promotion around her new record, including appearing live this morning on Chris Evans BBC Radio 2 show where she performed a brilliant cover of U2’s ‘I Still Haven’t Found What I Was Looking For’. Listen again here. Earlier this week, Imelda joined the Guardian for a webchat where she discussed a range of topics and questions sent in by fans including what is like to learn Bob Dylan is a fan of your music, followed by a rammed HMV in-store on Oxford Street, where she performed an acoustic set of material from her new album ‘Life. Love. Flesh. Blood’. ‘Life. Love. Flesh. Blood’ is one of the most critically acclaimed albums of this year. Praised by publications including Q, Uncut and Mojo (“A powerful new direction”), The Sun, The Mirror to the Mail On Sunday (who made it Album Of The Week, gave it four stars and stated: “Great albums tend to be growers, but this one grabs you at first acquaintance”). Support also comes from The Guardian, The Daily Telegraph (comparing it to Bob Dylan’s classic album ‘Blood On The Tracks’) alongside support from US industry publications Rolling Stone and Billboard Magazine as well as UK tastemaker music publications from The Arts Desk to The Four Oh Five. Recorded over seven days in Los Angeles, the album features musical contributions from guitar hero Jeff Beck (who plays guitar on the heart-wrenching single ‘Black Tears, which was A-listed at BBC Radio 2), piano legend Jools Holland (on ‘When It’s My Time’) and an accomplished group of backing musicians including the core trio of guitarist Marc Ribot (Tom Waits, Elvis Costello), drummer Jay Bellerose (Robert Plant and Alison Krauss) and bassist Zach Dawes (The Last Shadow Puppets, Mini Mansions). It is clear that one of Ireland’s biggest exports has found a new groove, presenting the most personal and intimately autobiographical album she has ever written. The album marks a new direction for May who, in the time since her 2014 release ‘Tribal’, ended her marriage of eighteen years. Imelda May’s new sound sits firmly outside of any sharply defined genre box, widely spanning blues, rock, soul, gospel and jazz. ‘Life, Love, Flesh, Blood’ breathes new life into a classic sound, with Imelda’s powerhouse vocal as distinctive as ever, cementing her position as one of the strongest vocalists of her generation. The singer herself describes the record as her most "honest" yet. Imelda’s life changed considerably in the run up to recording, and this is documented in the only way she knew how. “It's therapy, like keeping a diary that a lot of people read. Some of my favourite songs don’t say much, but they reveal everything.” Imelda explains. Imelda May, born and raised in The Liberties area of Dublin, has become one of Ireland’s most celebrated female artists in history. Discovered by Jools Holland, who asked Imelda to support him on tour, Imelda has gone on to perform alongside legendary artists including Lou Reed, Bono and Smokey Robinson and can count high profile artists including Bob Dylan (who recently revealed he is a fan of Imelda in a rare interview with Bill Flanagan) and Bono amongst her fans.